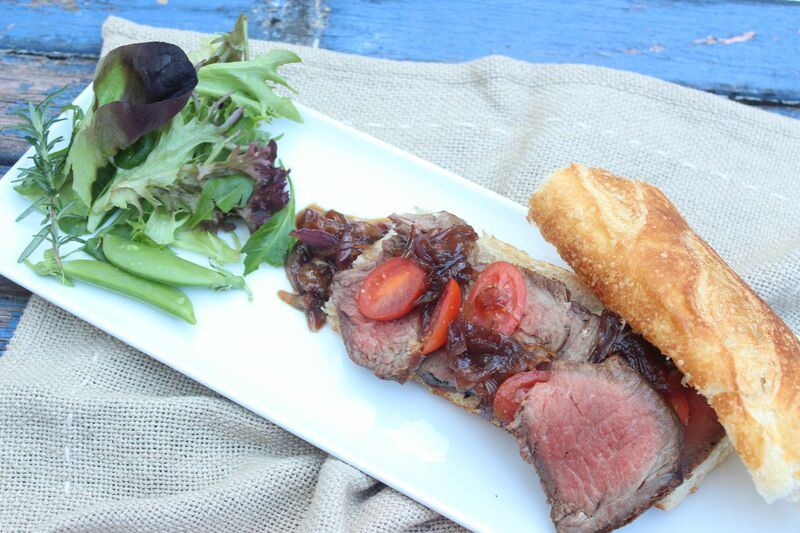 Roast scotch fillet on French bread with greens, cherry tomatoes and lashings of onion and raisin chutney. A perfect weekend lunch – my lunch today in fact! Very easy and quick to prepare, if you have the chutney already made and bottled. Another early Saturday morning walk to the Orange Grove Markets in Lilyfield yielded some lovely produce – fat red and brown onions, Jerusalem artichokes, baby salad greens, sugar snap peas, cherry tomatoes and French bread. The artichokes will be savoured later this week. 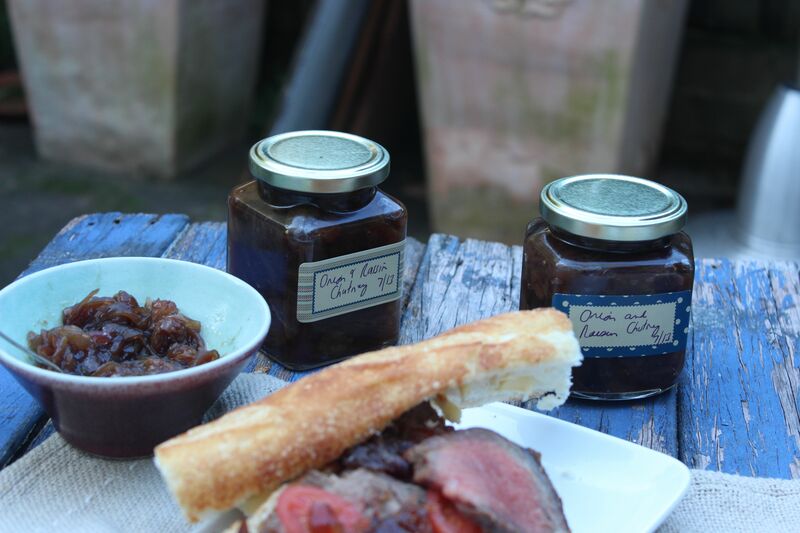 Sweet Onion and Raisin Chutney from July 2013 delicious. magazine. Heat the oil in a large frying pan over a medium high heat. Add onion and cook, stirring frequently, for 30 minutes or until the onions are soft and starting to colour and stick to the pan. Cook 15 – 25 minutes depending on the weight of the meat and how well cooked you like it. The piece of beef I cooked was 350 gms, and I cooked it for 15 or so minutes for medium rare. I used the skewer test – checking for “doneness” by inserting a skewer into the meat for a few seconds, removing and placing against my lip – cool means underdone, hot means cooked fine, scalding means overdone! I’m sure there must be a website somewhere that explains this principle a little more clearly! Remove from the oven when cooked to your satisfaction and leave to rest for at least 10 minutes before slicing thickly. 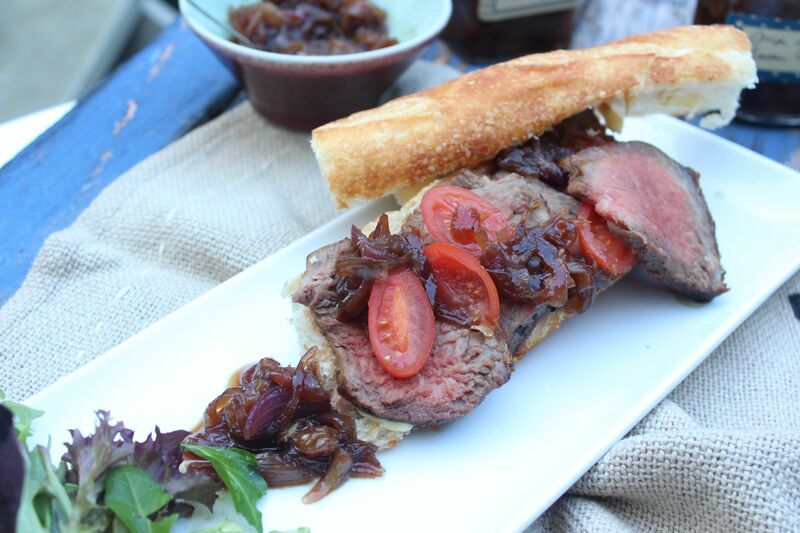 Posted in Savoury Food and tagged al fresco eating, baby greens, cherry tomatoes, chutney, French bread, onions, raisins, Roast beef, scotch fillet, sherry, sugar snap peas, sweet wine. Bookmark the permalink.